Pick this amazing Amiable Confectionery Collection for the dearest people in your life to make them feel special and loved. 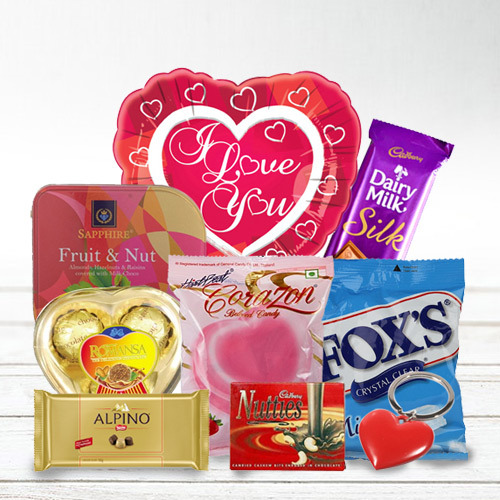 This Hamper is embraced with suave items like 1 Packet of Corazon Chocolates, 1 Packet of Fox's, 1 Box of Romansa Heart Shaped T3 Chocolates, 1 Heart Shaped Mylar Balloon, 1 Pc Nestle Alpino Bar, 1 Cadbury Dairy Milk Silk Chocolate Bar, 1 Heart Shaped Key Ring, 1 Packet of Nutties and 1 Box of Sapphire Fruit N Nut Chocolates. Flowers Delivery Tirupur, Send sweets Gopi, Wedding Cake Tirupur, Diwali Mithai Gaziabad, Send Flowers and Gifts to Nashik, Online Shop Gulbarga, Flower to Vishakhapatnam, New Year Flowers Sawai Madhopur , Fresh Fruits Hanumangarh, Send Gift Allahabad, Dry Fruits to Ratnagiri, Birthday Delivery Cuttak, Sending to Bhuj, Flower shop Tirupur, Lucknow Online Cake Delivery.